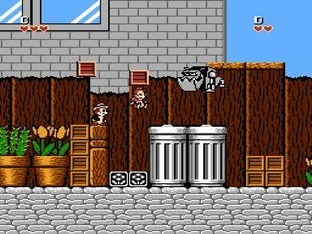 Chip 'n' Dale Rescue Rangers is a platform game that can be played alone or by two players cooperatively. There's ten stages and your mission is to rescue Gadget and defeat Fat Cat. You can attack by picking up and throwing boxes that are scattered around the levels or hide in them to kill any enemies that come into contact. These boxes can obviously be thrown sideways but also flung upwards. The game allows you three hits before you lose a life but you can top up by collecting acorns. There are many varied locations including a Casino, a Diner and a Toy Factory, and the bulk have horizontal and vertically scrolling areas to keep things interesting. Many also have multiple planes and you'll need to switch between the upper and lower platforms continually. Sometimes you can interact with the environment and jump on faucets to stop running water or throw boxes at switches to stop the endless supply of cannonballs. These are a neat touch and break up the onslaught of enemies. One disappointing part is when Gadget says she's left a boat for you but you only use it to cross a 5 second portion of the level! The bosses are simple and repetitive and the answer is usually to throw an item upwards to hit them. The adventure doesn't last long and it's not overly difficult but the platforming is solid with tight controls. It even features a fun co-op mode that gets very hectic with the amount of boxes flying around! The graphics have lots of colour but there's some flicker when too many sprites appear. The music is awesome and has the same kind of upbeat, catchy tunes as Duck Tales (1989) and Tiny Toon Adventures (1991). Chip 'n' Dale Rescue Rangers is a solid and enjoyable game that ranks among the best platformers on the NES. It doesn't push the genre but it takes the tried and tested formula and creates a refined, engaging experience with responsive controls and polished level design. Random trivia: A NES sequel called Chip 'n' Dale Rescue Rangers 2 was also developed by Capcom and released in 1993.